We never forget that you are the most important person in our business and the purpose of our work. Whether you are a faithful client or someone we've just met, your relationship is one that we value. We want to earn your business. 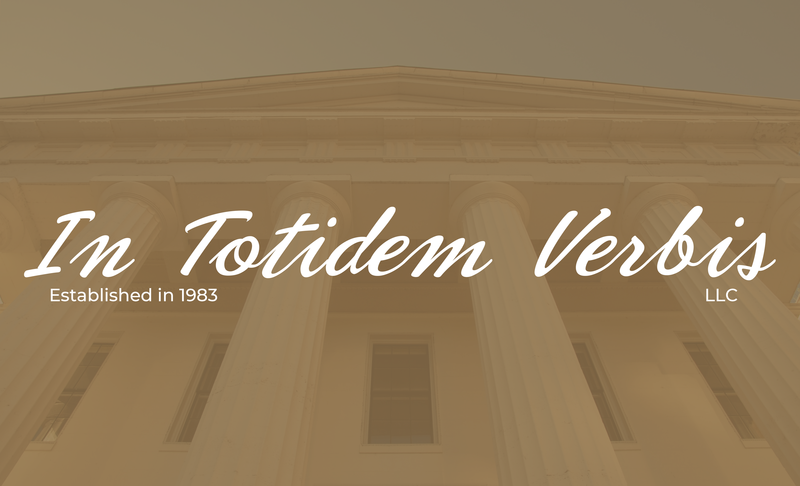 In Totidem Verbis, LLC's Certified Court Reporters offer litigation support services in a wide variety of areas. ITV, LLC was established in 1983 and today is owned by Callie S. Bodmer. We are members of the National Court Reporters Association, Illinois Court Reporters Association, Illinois Notary Public, DeKalb County Bar Association and Ogle County Bar Association. Our fee schedule is competitive with reporters in the area. Rate information is available upon request. Our coverage area brings cutting-edge reporting to much of northwest Illinois and eastern Iowa. Covering the Illinois counties of Bureau, Carroll, DeKalb, Henry, Jo Daviess, Kane, LaSalle, Lee, Ogle, Rock Island, Stephenson, Whiteside & Winnebago; and the Iowa counties of Clinton, Dubuque, Jackson, Muscatine & Scott. Including the Illinois cities of Amboy, Aurora, Byron, DeKalb, Dixon, East Moline, Freeport, Fulton, Galena, Geneseo, Kewanee, LaSalle, Mendota, Moline, Morrison, Mount Carroll, Oregon, Ottawa, Peru, Princeton, Rochelle, Rock Falls, Rockford, Rock Island, Savanna, Sterling & Sycamore. And in Iowa, Bettendorf, Clinton, Davenport, Dubuque, Iowa City, Maquoketa & Muscatine. Your deposition is not scheduled until you receive confirmation from ITV. Thank you.